I was really looking forward to Tuscany. 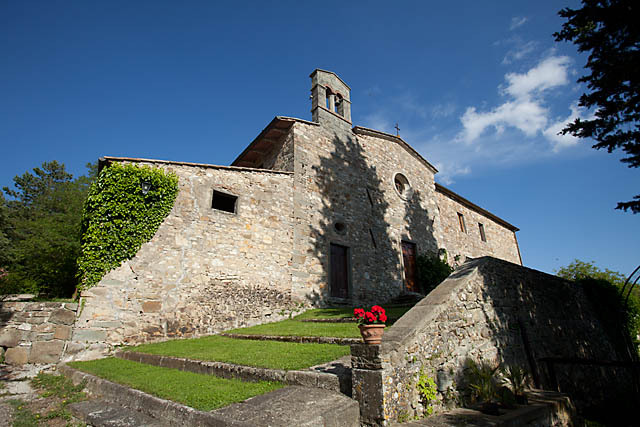 Visiting the smaller villages, tasting the Tuscan cuisine, drinking Chianti wine, and of course, photographing the beautiful countryside. But nobody told me that June 2 is a public holiday in Italy. And the small village I have booked my B&B is so off the main circuit that, well, on a public holiday, there are no buses going to it. When I arrived at Fattoria Poggerino though, I was grinning. A beautiful traditional old stone house retrofitted to modern living. 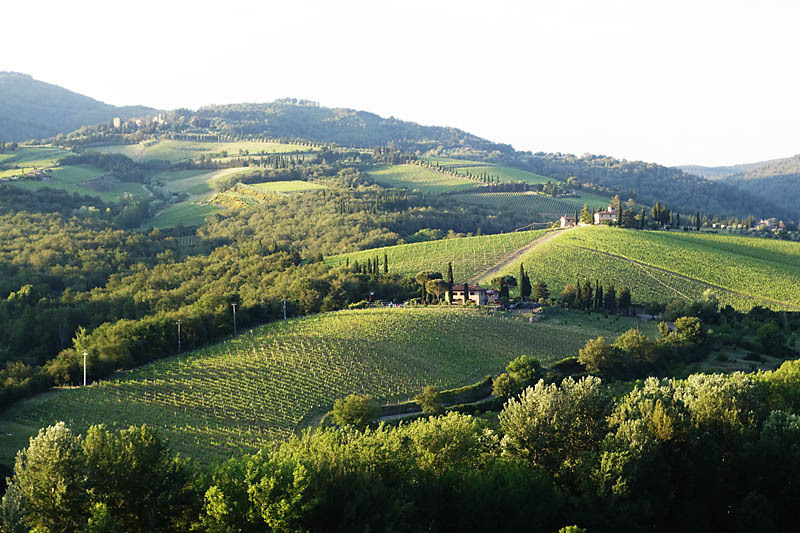 Perched atop a hill overlooking the Tuscan countryside laced with vineyards, the setting is just picture prefect. 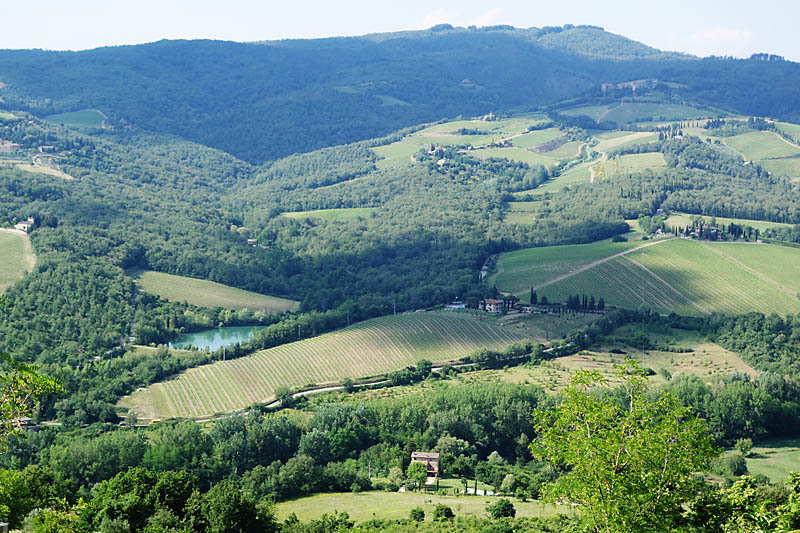 Poggerino is also a family run winery right in the heart of the Chianti Classico region. As a small family run business, they are very passionate about their land and what they do, and have adopted organic farming in their operations. 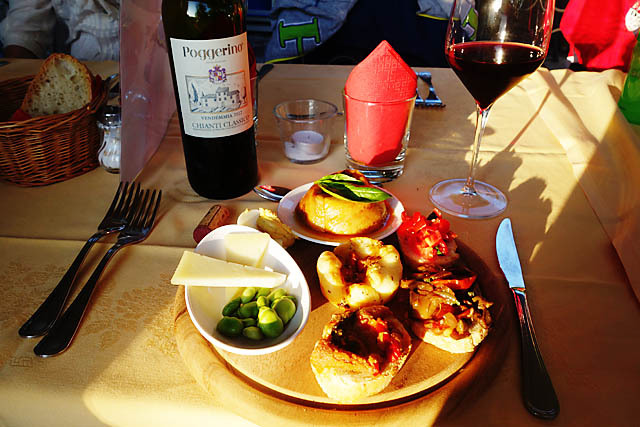 So their wines, olive oils and vegetables are a testament to their beliefs. First thing first though, I had to pickup my scooter in the village of Radda in Chianti 2km away. Traveling by public transport in Tuscany, while possible, is quite inflexible, as evident from my trouble in getting to Radda. 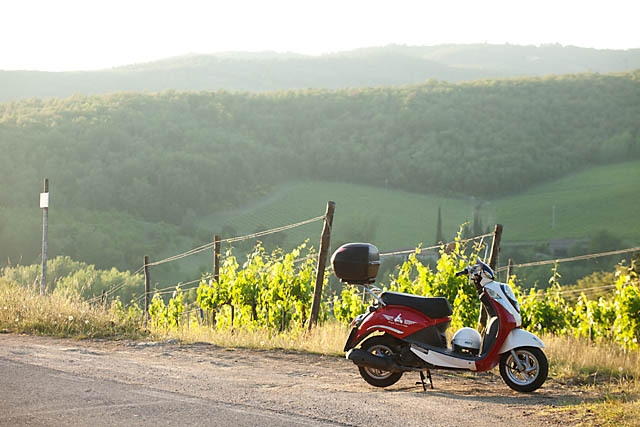 So I had decided to rent a scooter for my 2-day stay in Radda in Chianti (and well, Poggerino is not exactly in the village and I had to somehow get there too). Touring Tuscany in a Vespa, is quite popular it seems. The scooter rental requires only a valid driving license, and I had a brief experience with a scooter in my travels in China some years back, so I thought why not? Unfortunately, the rental agency recommended another scooter model for beginners instead of the Vespa. Slightly disappointed, as the Italian Vespa is almost synonymous with the scooter, I had to make do with a Sym Mio. It turns out the scooter rental guy is not based in Radda and had left the scooter and the paperwork to his friend, the sweet old lady in the tourist information centre in Radda in Chianti. "How do I, erm, operate and check the scooter?" I asked somewhat apprehensively. "I don't know... I am just helping out in the administration." "Why don't you call Luca?" She replied in the most motherly manner. So grasping her mobile which she kindly loaned me, I trudged to the parking lot, and went through the checking and operating procedures over the mobile. "So you hold the brakes, and press the electric switch to turn on the scooter.... yada yada yada..." Luca droned over the phone. Before long, I was heading back to Poggerino on the scooter. The setting sun on the Tuscan countryside was fabulous, and I was glad I had the scooter with me. The freedom of exploration was intoxicating. I've been a fan of small family-run bed & breakfasts for a long time. I remember my first bed & breakfast in Canada many years back. Together with some friends, we had a self-drive holiday in the Candadian Rockies, and stayed in this B&B. The host asked if breakfast at 8am was fine with us. It was certainly fine and next morning, as the few of us struggled lazily to go to breakfast, we reached the dining table at 8.25am. To my horror, our hosts and all his guests were waiting at the table, smiling as we make our entrance. I was so embarassed. But it was a super cosy experience, and I was so impressed that the food on the table was grown in the garden. It left a deep impression. Breakfast at Poggerino was different - buffet style with guests on their own table, but no less warm. Benedetta, owner and resident cook, was on hand to explain the spread, as each group of guests arrive. The homemade yogurt and granola made me sad - I now live with the knowledge that back in Singapore, I will be missing out so much goodness. 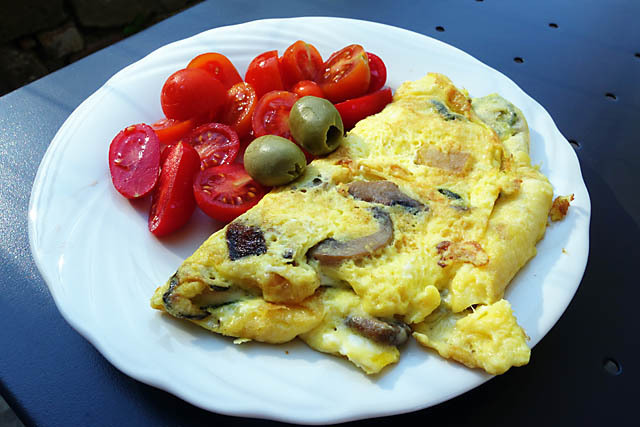 The cherry tomotoes served with the omelette was flaming red and seemed to be bursting with freshness. The 4 different sweet pies begged to be tasted, but I've had my limits. It was a great breakfast and a fantastic start to the day. I am so looking forward to the dinner later that night. The air sweeping past my face felt good as I scootered through the countryside. 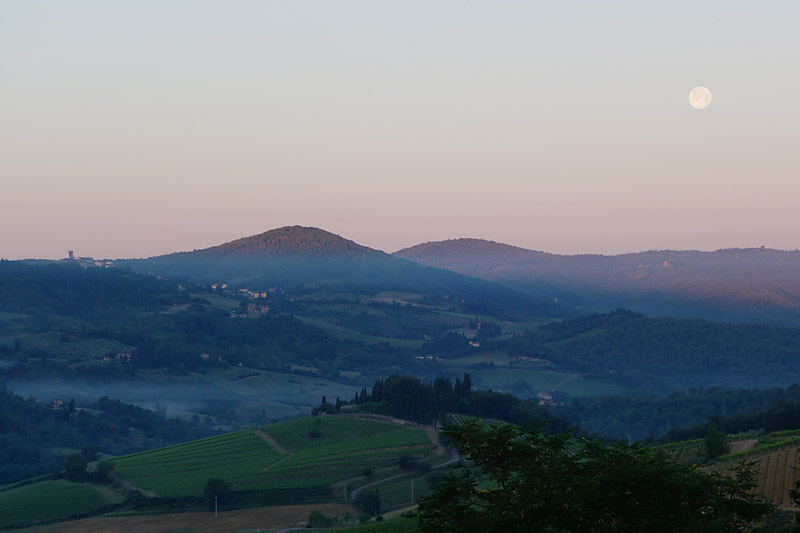 However, as I leave Radda in Chianti to go further afield, the traffic seemed quite abit heavier. The curvy roads in Chianti didn't help a newbie rider as well.It was beginning to be a little harrowing. And all it takes is a momentary lapse of concentration. I turned at the intersection catching a glimpse of a car at the corner of my vision a tad too late. A short screeching, a loud blaring of horn, and I wobbled and slowed to a stop by the side of the road. A car pulled over and I had an earful of French (I think) tirade. I was also somewhat dazed, and all I could say was just "Sorry" repeatedly. They left with something that sounded like "You lucky". Indeed. I took a moment to compose myself before I moved on. I decided not to go further, and had an early return. I felt lousy, relieved, stupid, and a whole lot of other feelings all vying to take control, but in the end, I just waited for the dinner. Dinner was more proper, with all guests being seated before being served. There was a Taiwanese family of four, me, and the rest were from France, Italy, Germany and Denmark, making a total of 15. Bernadetta was again on hand to explain what was being served. It was a simple 3-course meal, with the antipasto (starter) immediately winning my heart with its different bruschettes and a uniquely presented aubergine. The primo (first course) consists of gnocchi which was good but nothing spectacular. The dessert though, brought things back to "spectacular" levels. A thick aromatic expresso concluded the meal, though Bernadetta later offered us a taste of her homemade grappa as well. The French lady have been staying in Poggerino for more than a week, and I asked how many dinners had she had. Surprisingly, this was the first! Apparently, Bernadetta only prepare dinners when there are enough guests, and I counted myself lucky that in my brief two day stay, I got to try more of her cooking. With good food, good wine, and good company, the episode of the day earlier was soon washed away. 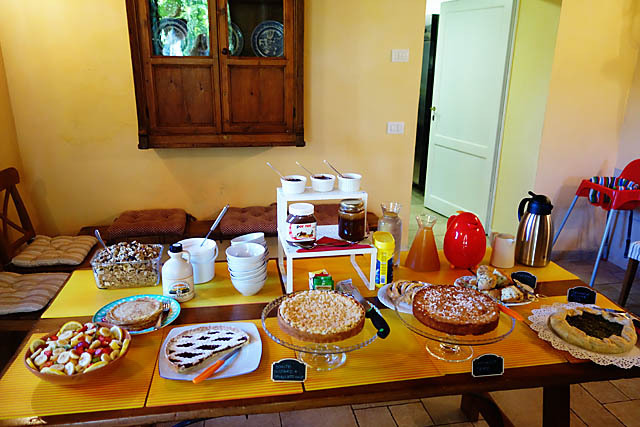 Sadly, I had to miss Bernadetta's breakfast the next morning as I had to catch the early morning bus to the next town. All I could get was a cold sandwich pre-made the night before. I also managed to get a lift into town, or rather, my luggage manage to get a lift into town. The staff at Poggerino offered to bring my luggage into town while I rode my scooter to return it. I had been apprehensive about riding the scooter with my luggage behind but thankfully, everything turns out well. Well, relatively speaking I suppose. The original plan was to get a bus from Florence to Radda; rent a scooter for 2 days; use the scooter to transport myself around Radda, including to Poggerino; return scooter on final day and take bus to next town. Things completely didn't go as planned. But they "turned out well" I guess, considering that I am still in one piece! !